My obsession with a ramen noodle stir fry all started a few weeks ago when I was at my parent's house over lunch time. I was hungry, my Mom was hungry, and we're both dairy free, so, I'm pretty sure her words were "all I have is asparagus.... and noodles -- that sound good?" 😂 But actually, it was amazing. And it caused me to come home and figure out my favorite ways to stir fry any seasonal veggies I have on hand, and eat ramen noodles at the same time. 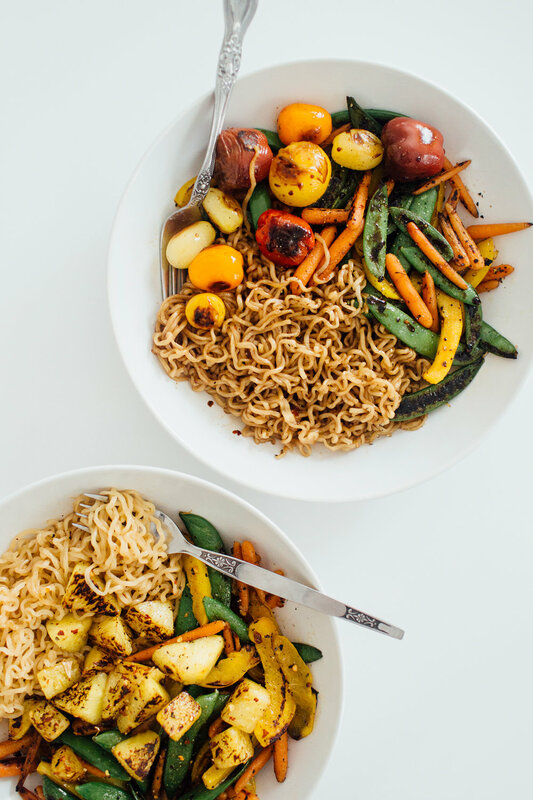 I've added everything from broccoli, to butternut squash noodles, from red onions to yellow zucchini, and these two sweet + spicy sauce combos hold their own every time. So, as always, I'd encourage you to make it your own. Cooking should be fun. And if you're a little uncertain, follow my recipe word for word this time, and then next time be more adventurous. Heat olive oil in skillet over medium-high heat and begin to boil water for noodles in a separate pot. Wash and prep your veggies and pineapple, keeping in mind that you may add any seasonal vegetables you have on hand, not only the ones I listed above. Add veggies and pineapple to hot skillet, season with salt, pepper, and garlic. Stir the skillet every few minutes so all parts of veggies get that nice brown/black stir fry flavor from the hot pan. By now your water should be boiling for your noodles. Cook the ramen according to it's package, drain and set aside. Once you feel your veggies are cooked and easy to poke with a fork, turn off the heat. Or, 2. 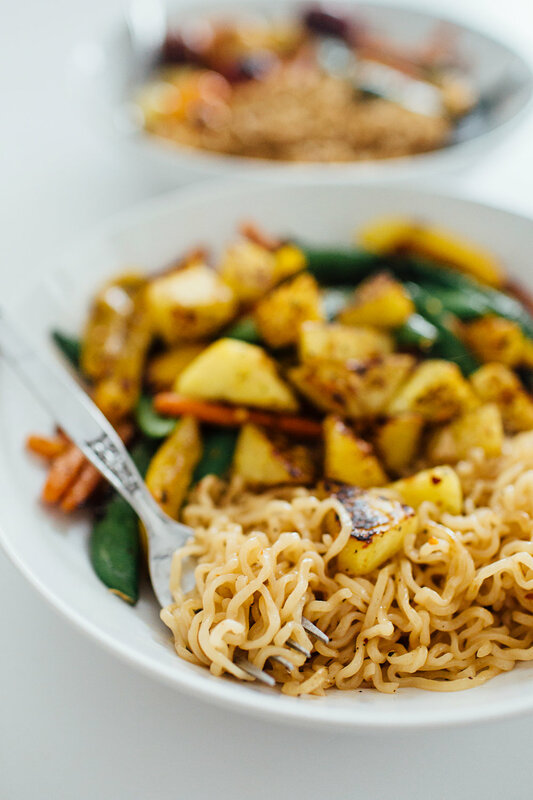 Add noodles directly to your skillet with the veggies, and make the sauce on everything. I've done it both ways, and it tastes the same. 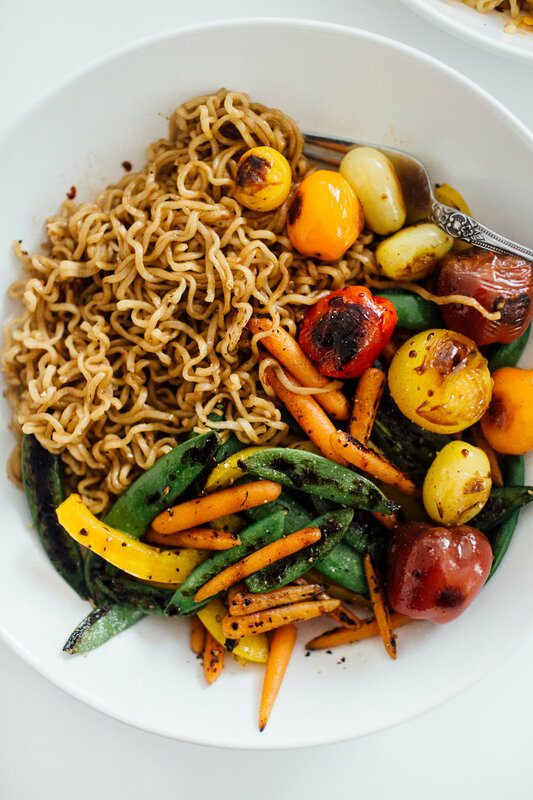 For this post, I only made the sauce on my noodles, leaving the veggies with their bright pan fried colors. Once everything is coated in your sauce and the noodles are warm again, transfer to a large plate or bowl. Season with salt and pepper again if you'd like. Sit back and enjoyyyyy. Tip: If I'm not in a hurry, sometimes I cook my pineapple in a separate little skillet. They don't take nearly as long to cook, and by keeping them separate I ensure that they don't get all smushy cooking along side the veggies. I like a little crunch left in the pineapple, especially when you add a dash of red pepper flakes on the very top right before you take your first bite! Serving Size: One ravenous Mother whose kids are finnnnnallllly napping. Wash and prep your veggies, keeping in mind that you may add any seasonal vegetables you have on hand, not only the ones I listed above. Add veggies to hot skillet, season with salt, pepper, and garlic. Stir the skillet every few minutes so all parts of veggies get that nice brown/black stir fry flavor from the hot pan. Tip: Sometimes I cook my tomatoes in a separate little skillet. They don't take nearly as long to cook, and by keeping them separate I ensure that they don't get smashed to bits while stirring and cooking the other veggies.